In 2011, right after leaving a dream job as a journalist, Max Lugavere realized his mother was starting to show early signs of memory loss. Being in between jobs, he was able to accompany her on the quest of figuring out what was happening to her memory. There was just one problem: Doctor’s couldn’t give them a definite diagnosis. After countless doctor visits, they finally found a medical team that diagnosed her with neurodegenerative disease. They gave her medications for both Alzheimer’s and Parkinson’s because the exact variant of her disease was still unclear. This life-changing diagnosis prompted Max to take matters into his own hands. Instead of waiting for someone else’s solution, he jumped into a years-long research about brain health, nutrition, and lifestyle, to try to understand the root causes of dementia and what he could do to help his own mother. Max went on to become a brain food expert and famous health and science journalist and filmmaker. 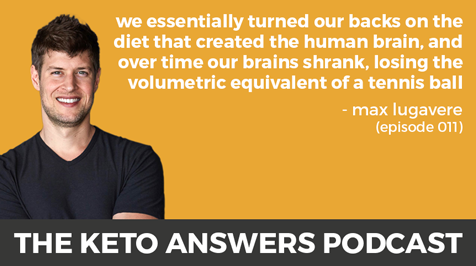 He’s also today’s guest and in this episode he tells us what he found in his research, what he did to help his mother, and what we can all do to improve our brain function through nutrition. One of his most interesting findings is how much our brains have changed from our hunter-gatherer days to agricultural society. The foods abundant in a Western diet interfere with the brain’s protective mechanisms, making the incidence of dementia much more likely. Luckily, he also found the type of nutrition that can help us protect and boost our brain function. In this interview, he talks about the effects of a ketogenic diet and specific nutrients and foods you should start eating if you want to prevent dementia. You can learn more about his research and specific recommendations in his latest book, Genius Foods: Become Smarter, Happier, and More Productive While Protecting Your Brain for Life, which contains everything he’s learned about brain health and nutrition throughout the years.